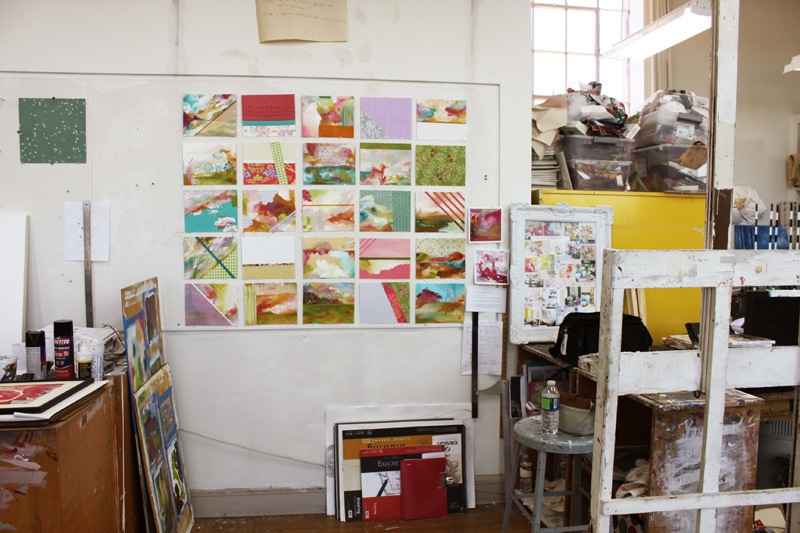 This was my studio space in the Advanced Painting room at Tulane. I shared this room with several other pretty cool people (and pretty awesome artists). Our end goal was to produce a body of work for our end-of-the-year, Bachelor of Arts Exhibition. 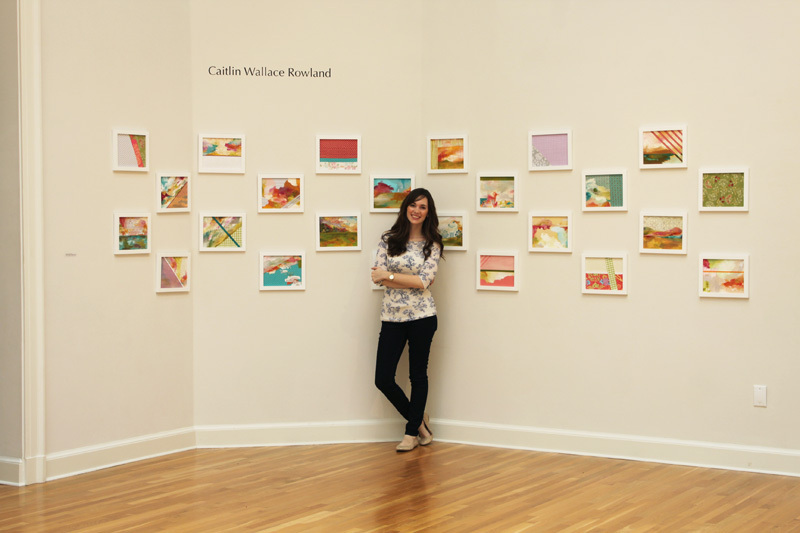 Our exhibition was up in the Carroll Gallery at Tulane from May 9th-May 17th. 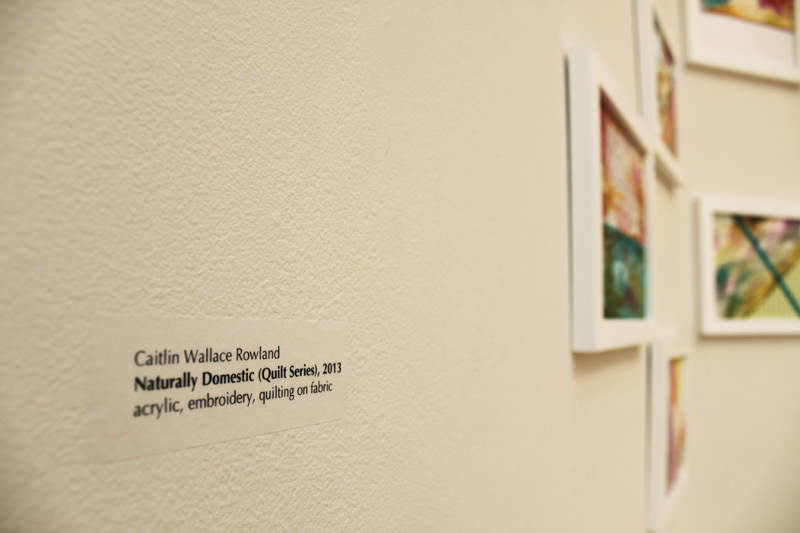 It was a really awesome experience to have my work shown in a gallery. 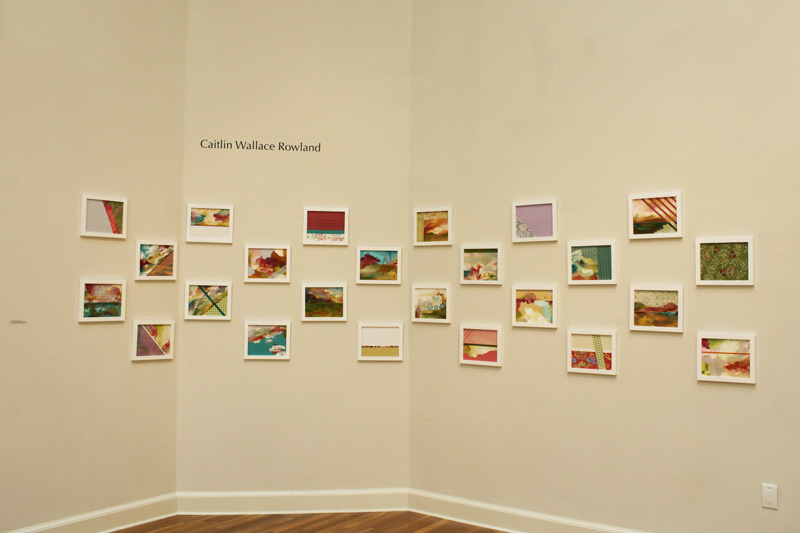 Here is my final exhibition, a quilt series of twenty-four (I actually did more, these were just the ones I ended up showing) abstract landscape paintings, painted on cotton quilting fabric, some fabrics sewn together, and some including machine and hand embroidery. I grew up in rural Southern Illinois on land that has been passed down through my family for generations. Before I started school, I spent every day with my grandmother, who encouraged my love of watercolor painting and being creative and who established the foundation for my personality and moral beliefs. My grandpa wrote stories, fished everyday, and grew a huge garden that I helped him harvest. I loved snapping off the ripe asparagus, helping my grandma cook, and laying in the hammock in their backyard. Just down the road was my own house, where I climbed trees and ran through the creek with my sisters and brother, helped my dad work in the yard and feed our chickens, and helped my mom plant flowers and herbs, cook and bake. Throughout my childhood, my mom imparted to me her creative knowledge – sewing, hand embroidery, cross-stitch, smocking, machine embroidery, knitting, crocheting, and basket weaving. After moving to New Orleans for college, I started thinking more about my own childhood and the different backgrounds of those around me. I began to really question the idea around our sense of place—how people live, where they live, why they live there—the spaces people create for themselves. How do these places impact our personalities and our interests? During this time, I also developed a love for interior design—a way to carve out a space for myself that felt comfortable and familiar, a place where I could mix my former and current worlds in a way that was also beautiful and intriguing. My art aims to capture a sense of personal history, exploring both the past and the present, questioning the differences in the city and the country, and highlighting domestic pursuits and interior spaces and exploring their connection with the natural world. I’m interested in the juxtaposition of interior and exterior spaces—nature and domesticity, home and homestead, city and country—but also interested in how they work together and are innately connected. Because of my upbringing, I’m very interested in the use of sewing, embroidery, quilting, fabric and pattern and how those elements can intertwine with paint to create images. I’m also interested in the elements that make up interiors—paint, fabric and textiles, wood textures, natural elements, metal finishes—and how many of those elements find their roots in the natural—cotton, linen, wood, and minerals. One of my aesthetic and conceptual goals is to somehow marry interior and natural elements into a single image, developing a quilt of sorts, that evokes a feeling of comfort, sentiment, and history that an interior of a home or a familiar natural setting provides. If you want to check out more of my artwork, you can visit my portfolio website, here. To check out work from the other artists showing with me, visit our exhibition website, here.